Today NDT International addresses the demands for cutting edge technologies for applications in the field of Non-destructive testing. Our products include coating thickness measurement, flaw detection, corrosion assessment and weld flaw detection; liquid level measurement, vacuum leak detection, state of the art custom transducers, probes, scanners and calibration blocks. NDT International is the oldest NDT company in the United States operating under the same ownership and the same location since January, 1971. The company was originally a manufacture’s representative for outstanding products manufactured outside the US, and a supplier of qualified ultrasonic personnel. Since that time we have designed, built and patented various equipment for use in the NDT field utilizing various disciplines. Our earliest manufactured product was an acoustic emission based on-board monitoring instrument, the OBM 500, for which we hold a U.S. Patent. The monitor listened for the sounds generated by fibers breaking within an FRP structure and alarms personnel to potential damage and dangerous conditions. The product was a continuous monitoring system used on such fiberglass structures as the boom on a utility company bucket truck or FRP storage tanks. Soon after, we expanded our acoustic monitoring knowledge into development of a system to verify the Open/Closed status of the critical safety relief valves in nuclear power generating facilities. NDT International, Inc. supplied a number of these systems to nuclear facilities in the US from 1979 through 1985. With the decline in fabrication of new nuclear power facilities we have continued our efforts by providing spare parts and service to our exiting clients. NDT has recently partnered with Nuclear Logistics Inc. of Forth Worth, TX – the largest 3rd-party supplier of safety-related equipment in the world – as further means to meet the quality assurance requirements necessary to the nuclear power generation industry. Production of the valve position monitoring system led to our development of an acoustic leak detection system. This system was designed to monitor boiler tubes, feedwater heaters and other steam based systems for the presence and growth of leaks. As in the fiberglass monitoring system described above, the equipment “listens” for sounds generated by the plant operating equipment, indicating a potential or existing problem, and initiates an alarm to alert plant operators. This early warning allows plant personnel to implement a scheduled outage for repairs, saving emergency down time costs and additional damage to equipment. NDT International, Inc.’s OLM systems are operating in twenty-four plants, for boiler tube and feedwater heater leak detection. This is a total of over five hundred forty channels of leak detection equipment, including a large two computer/four boiler system supplied to the federal power generation organization in Setubal, Portugal. NDT International, Inc.’s acoustic leak detection system made use of our software and technology to provide accurate leak detection, precise signal recognition, increased sensitivity and leak analysis through color graphics displays. Due to reductions in plant expenditures we discontinued production of the systems in 2002. Our initial venture into the ultrasonic equipment industry was the NDT-701, a small portable analog design thickness gauge with LCD digital display first manufactured and sold from 1981 to 1994 when we introduced the fully digital model NDT-710. We now offer gauges with both pulse-echo and multi-echo capabilities, A-Scan and B-Scan displays, data logging and even a gauge that can measure both the metal wall thickness and the coating thickness of a painted structure at the same time. NDT International, Inc. manufactured a line of analog design ultrasonic flaw detectors with CRT display, adjustable flaw gates and an internal battery charger starting in 1985 with our model 801 SUPERSCOPE. In 1986 the 801D was introduced, adding interface gating, distance amplitude correction (DAC) and a digital thickness display. We supplied these ultrasonic flaw detection instruments to the U.S. Navy for use on board maintenance support vessels for the nuclear submarine fleet and to various other maintenance and repair facilities of the Atlantic and Pacific fleets. 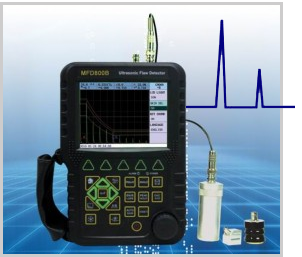 NDT International, Inc. now offers four different models of fully digital portable ultrasonic flaw detection instruments. NDT International, Inc. developed a magnetic wheeled “Crawler” inspection system with a steerable DC powered crawler vehicle carrying a dual transducer and cable assembly for the transducer signals utilizing our analog CRT display 801D SUPERSCOPE, a portable strip chart recorder and a transducer, motor power and water line cable assembly. The system provided accurate, hard-copy strip chart recordings (the digital version is now called a B-Scan) of thickness surveys of steel storage tanks and piping. Our current version of the crawler system is adaptable to a number of high-end digital thickness gauges and flaw detectors. The vehicle has been adapted for ACFM and CCTV inspection applications. In the summer of 1995 we introduced the Corona 500, a portable single channel acoustic monitor with on-board data logging capabilities. This instrument was developed to detect partial discharge conditions in large electronic transformers, motors and switch gear. Our Corona 400, released in the fall of 1996, was a portable ultrasonic leak detector designed for locating leaks in air lines, gas distribution lines, steam lines, etc. in pressurized systems, as well as leaks in weather stripping, seals, bulkheads, hatches and other water-tight closures. Both of these instruments have been discontinued. In addition to our own products noted above, NDT International, Inc. has assisted in the design, development and manufacture of many specialized products and systems. We have designed and manufactured a valve diagnostic system for Fisher Controls International. Our SCRAM Control Rod Insertion Timing System was developed and installed at PECO’s Peach Bottom and Limerick Nuclear Generating Stations. NDT International, Inc. worked with the DuPont Company to develop a mobile on-line system for remote monitoring and reporting of wheel bearing wear, internal temperature and pressure level fluctuation, and precise location of railroad tank cars through use of a Global Positioning System (GPS) reporting through a cellular telephone connection with microcomputer and modem system. We now offer a full line of hand-held instruments including dual element thickness gauges for corrosion and erosion monitoring, fabrication and machine shop applications, precision gauges for measuring thin materials, coating thickness gauges for measuring paint, anodizing and other types of coatings on metallic material plus instruments for conductivity testing and ferrite content measurement. As our focus on manufacturing changed we increased our emphasis on providing a variety of other equipment, supplies & accessories and testing services for our customers as a manufacturer’s representative and now work with more than 20 other companies. NDT International, Inc. has always been a hands on service oriented company; capable of meeting nearly any nondestructive testing need, whether it is equipment, consulting or inspection services, supplies, or accessories. If you have any questions, need specific information on any of our products, or want to discuss a project or problem, please feel free to contact us at any time. We look forward to hearing from you and hope that we may soon become a valued supplier of nondestructive equipment, accessories and services for your company.